When you look at the number of women dominating the landscape of modern television, it’s hard to believe that Hollywood would still dare to undervalue their female stars. And yet, issues of equal pay across genders continue to plague the industry — most recently affecting Julianna Margulies’ decision not to appear on The Good Fight. The Good Fight, for the record, is a CBS All Access spinoff of The Good Wife, the CBS drama Margulies starred in for 7 years. While CBS had approached Margulies to reprise her role as Alicia Floreck for a three-episode Good Fight arc, the actor was forced to say no following a pay dispute. Initially, Margulies wouldn’t say more than that “[she] was really excited about the idea, but CBS refused to pay” her ask. On Sunday, she revealed further details to Deadline: she’d requested her regular fee (Deadline notes the fee was in line with what Margulies was paid for The Good Wife), but was instead offered Good Fight‘s guest star rate. Understandably, Margulies had some objections to this designation. “I’m not a guest star,” the Emmy-winning actress told Deadline. 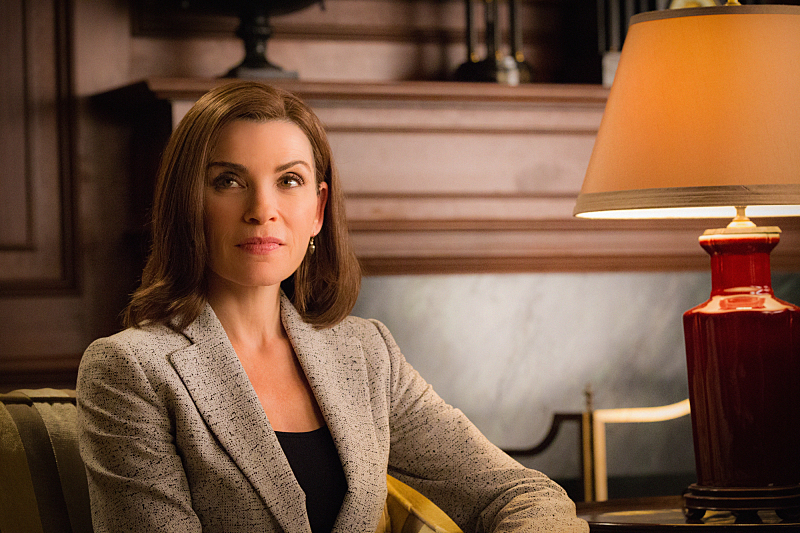 “I started the whole thing with The Good Wife. I wanted to be paid my worth and stand up for equal pay. if Jon Hamm came back for a Mad Men spinoff or Kiefer Sutherland wanted to do a 24 spinoff, they would be paid.” Given the influx of equal pay scandals in recent years, one would think CBS would have given their decision a second thought. Just this Tuesday, Michelle Williams spoke at the US Capitol in support of the Paycheck Fairness Act, a proposed legislation that targets the ongoing wage gap. Williams has more than enough experience with this issue, given last year’s reveal that she was paid less than $1,000 for All The Money In The World re-shoots — while co-star Mark Wahlberg was paid $1.5 million. Williams says she was “paralyzed [by] futility” when she heard the news, and credits the backlash to her low paycheck to Jessica Chastain taking to Twitter, where the story went viral. After all, while Williams’ story is shocking, it’s sadly far from unique. In 2017, fierce female House of Cards lead Robin Wright revealed that she was not only paid less than co-star Kevin Spacey — she was explicitly lied to, and told she was earning the same. To add insult to injury, it was Wright who came to the show’s rescue last year, when production was suspended following sexual misconduct allegations against Spacey. Wright, despite the show’s less-than-graceful treatment of her, fought hard for a final season, and ultimately succeeded in resuming the production. According to her co-star Patricia Clarkson, this was largely done out of concern for the hundreds of cast and crew members whose livelihood had been threatened by the hiatus — perhaps proving that Wright’s presidential aspirations have a place off-screen as well as on. While Margulies standing up for her worth is noble, women in Hollywood and beyond need to take her story as evidence that no matter how far we think we’ve come, we have a long way to go to simply be recognized for our value.